Experts have long known that as oil paintings age, soaps can form within the paint, degrading the appearance of the artworks. The process significantly complicates the preservation of oil painting, along with valuable cultural manifestations, which the paintings themselves help to preserve. 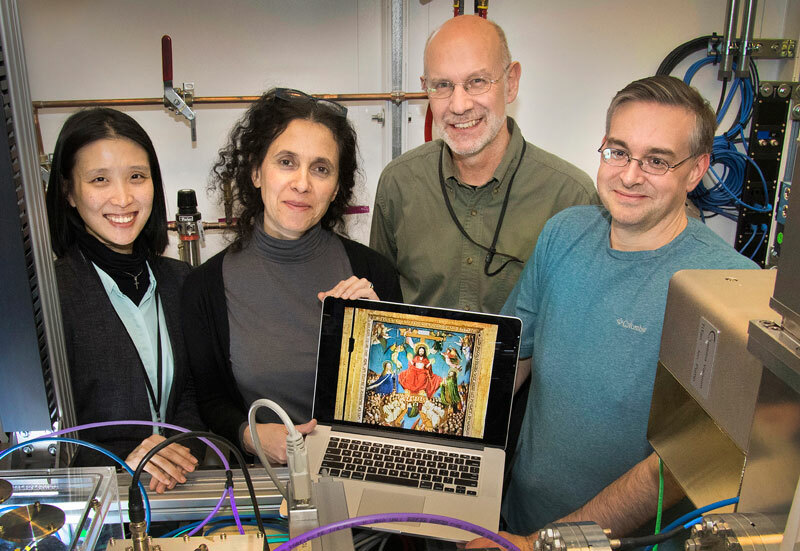 Scientists from Brookhaven Lab and The Met used beamline 5-ID at NSLS-II to analyze a microscopic sample of a 15th century oil painting. Pictured from left to right are Karen Chen-Wiegart (Stony Brook University/BNL), Silvia Centeno (The Met), Juergen Thieme (BNL), and Garth Williams (BNL). Karen Chen-Wiegart, an Assistant Professor at Stony Brook University with a joint appointment at Brookhaven National Laboratory (BNL) is part of a scientific collaboration led by researchers at The Met, the University of Delaware, and the U.S. Department of Energy’s (DOE) BNL that could help to answer these questions. 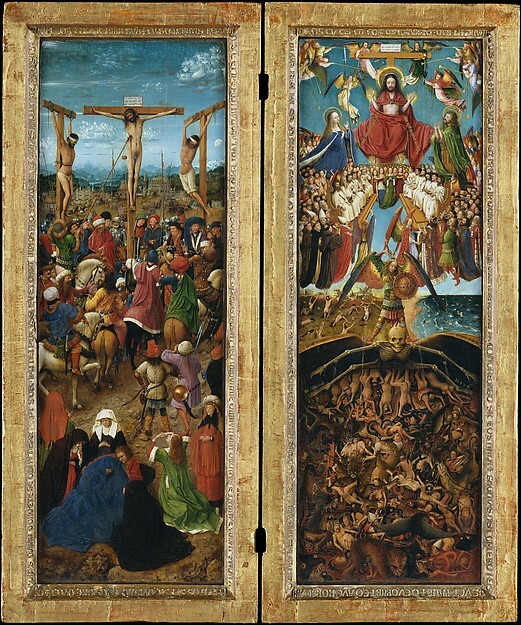 By analyzing a microscopic sample from The Crucifixion, a 15th century oil painting by Jan Van Eyck, the research team was able to determine which components in the paint were responsible for forming soaps. Their findings were published in Scientific Reports. In order to study the tiny chemical features in the sample, the scientists needed the advanced capabilities of the x-ray microscope at beamline 5-ID at the National Synchrotron Light Source II (NSLS-II)—a DOE Office of Science user facility at Brookhaven Lab. 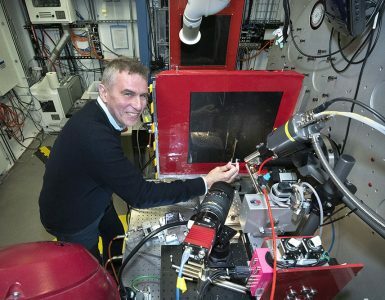 This beamline has the unique ability to image the chemical makeup of complex structures, making it the perfect tool for studying small samples from works of art. “Because these samples are so small, we needed beamline 5-ID’s sub-micron spatial resolution, and the expertise of the beamline staff,” Centeno said. Using a research technique called x-ray fluorescence microscopy, the scientists directed NSLS-II’s ultra-bright x-rays at the painting sample while moving the sample horizontally and vertically. This enabled them to generate maps that show how different elements are distributed in the sample, and determine how these elements had moved within the paint due to the deterioration. 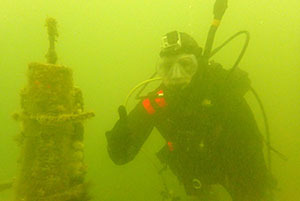 Additionally, using a technique called x-ray absorption spectroscopy, the scientists identified the presence of chemical compounds that were the products of deterioration reactions within the sample. While the current study focused on one type of pigment, the collaboration intends to study how soap formation varies among different pigments, as well as the effects of temperature, humidity, and the paint’s porosity. 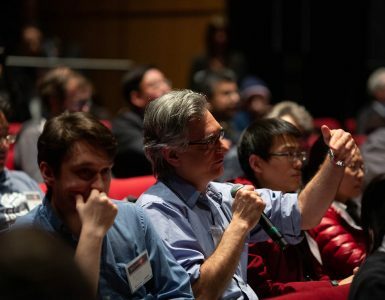 They also hope to use a wider range of synchrotron techniques at NSLS-II to gain a more comprehensive understanding of the deterioration mechanism.